Billy Moore's greatest, most valuable tool is his consummate experience in both performance and education. He has an enviable empathy with his students, and many claim him as their mentor and life-long friend. 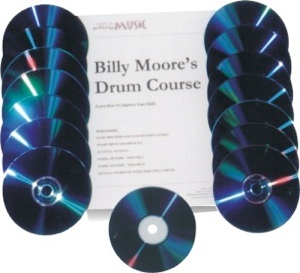 Billy has written a full course of study for drums. Read about these valuable treatises and the comments of those who have been Billy's students, and you'll probably want to own these gems yourself. You can purchase any individual component that suits your particular needs, or the entire course (a $200.00 value if purchased separately) at a discounted price (below). Billy Moore, P.O. Box 1683, Marietta, GA 30061. 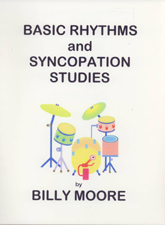 Course 1: Basic Rhythms and Syncopation Studies A new and modern method for rhythm and syncopation studies. Study level: Beginners to Advanced. Can be used effectively by all students, classes and the working professional seeking to enhance, polish or maintain playing skills. This book is also good for rhythmic studies for all performers. Course 2: Course of Study for Snare Drum and Drum Set Ways to Practice, Rhythm Graph, Rhythm Notations, Rhythm Studies and 6/8 Study, Chart Practice Exercise, Rudiment Study Chart, Ratamacues, Solo de Rat, Flams, Paradiddles and Drag Exercises, Rudiment Solo by the Numbers, Dotted Notes, Steps for Practicing (Rock Beats), Additional Steps to Soloing, Extended Solo-Drums, Basic Practice Chart, Practice Chart, Cut-Time Big Band Figures, List of Principal Words and Percussion Equipment List. Course 3: Accents, Accents A step-by-step approach to Accents for the modern drummer. This book is designed to enhance your technique and open your imagination to endless ideas. Included are Billy's Twelve Steps to non-stop soloing ... and pure unadulterated drumming enjoyment! Course 4: Inside, Outside Vol. I, Variations on Written 4/4 Patterns A valuable course for drummers, arrangers, musical directors, stage band conductors and students of music. The course explains and illustrates many notated 4/4 patterns and their variations. This is an invaluable aid to enhancing your skills in reading figures and charts. Course 5: Inside, Outside Vol. II,Variations on Written 3/4 Patterns A valuable course for drummers, arrangers, musical directors, stage band conductors and students of music. The course explains and illustrates many notated 3/4 patterns and their variations. This is an invaluable aid to enhancing your skills in reading figures and charts. Buy both volumes of Inside, Outside and receive a discount. Covers basic Conga Rhythms, Hand Techniques and Symbols, as well as Latin Rhythm Exercises, Practice Charts and much, much more. This is excellent for beginners, individual or class use. All Six Courses With Fifteen (15) CDs: $200.00 value.